Parrot Pizza franchise business opportunity. 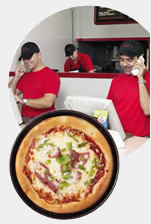 Free Parrot Pizza business franchise information. At Parrot Pizza, we know that great food is the basic ingredient of a great restaurant. And while our pizza's terrific, we're not just pizza. We offer a unique menu with fine-tuned recipes that have made our food the talk of the town. Plus, we've created a restaurant environment that's fun! The store décor is lively and colorful...Parrot Pizza is truly a one-of-a-kind place to eat! We offer quick delivery of our fresh, hot food so our customers can eat in our sparkling clean dining room or get their order brought right to their front door. It starts with the famous Parrot Pizza… featuring our signature light, golden-brown crust made from fresh (never frozen) dough, real cheese and the highest quality toppings. Plus dozens of hot, baked sandwiches (grinders), such as steak, chicken parmesan and eggplant. Authentic pasta dishes including ravioli, stuffed shells, spaghetti and ziti; freshly prepared salads, stromboli, chicken and fresh seafood round out the menu. Americans have an insatiable appetite for pizza. 94% of us eat pizza, consuming a total of 100 acres of pizza a day. We spend over $29 billion on our favorite delivered food every year, which accounts for over 10% of all food industry sales. Hungry for your own Business? A unique menu that begins with great pizza and includes ravioli, stuffed shells, spaghetti, ziti, salads, stromboli, chicken, seafood, and hot sandwiches such as steak, chicken parmesan and eggplant. Add dine-in, take-out and delivery options, and we enable franchise owners to generate potential activity from a wide range of occasions. A name that brings a smile to customers' faces. We've created a distinctive brand identity based on fun Parrot characters that we carry through signage, décor and packaging. A computerized system that integrates all aspects of your business and is designed to help make Parrot Pizza highly efficient. Parrot Pizza marketing that embodies a commitment to quality and an obsession with great-tasting pizza. We give guidance on marketing strategies, from email newsletters to suggested community events. The Parrot Pizza franchise program provides the training, support, and programs to help you establish a Parrot Pizza restaurant in your market and to continually grow your customer base in the years to come. Claw your way to the Top! Introducing Parrot Pizza into a new community is an exhilarating and exciting opportunity. While the demands are great, the rewards can be exceptional. After ten years of trial-and-error, of fine tuning our products, systems, and brand identity, we now have all the pieces in place for ambitious individuals to start delighting customers in their hometowns. We're looking for people who share our vision and commitment and who can mix serious business with serious fun to join the Parrot Pizza family of franchise owners. To learn more about the Parrot Pizza franchise opportunity, simply complete the form below.